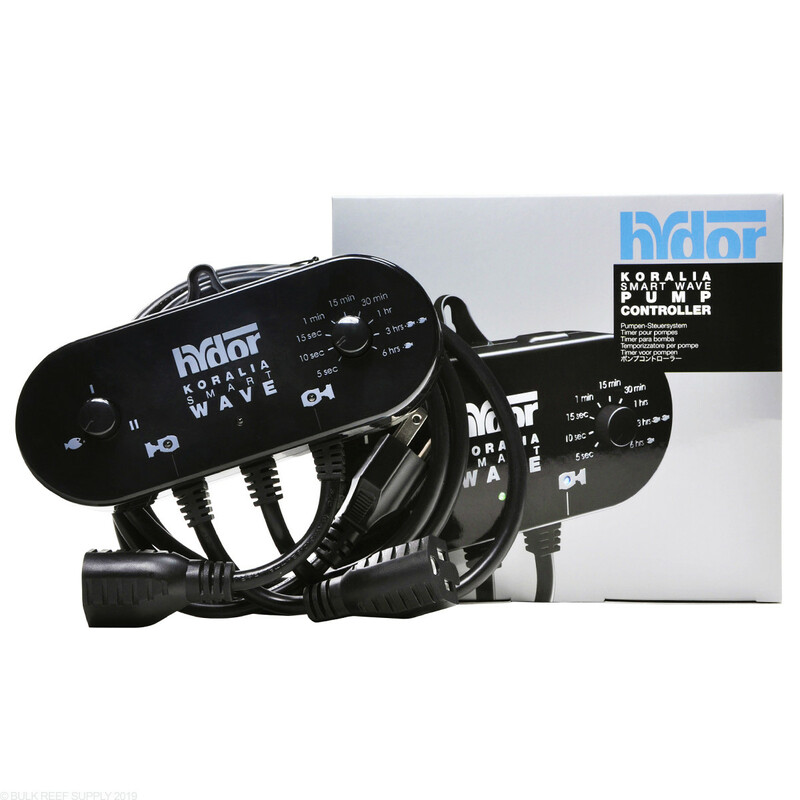 Promote a healthy aquarium with the Hydor Koralia Smart Wave Pump Controller. Control one or more pumps on two separate channels with a wattage limit of 100 Watts each. Control up to 16 Koralia Evolution 1400s on each channel. Inexpensive way to create natural currents and random flow rates in your tank. Smart Wave installation is a breeze with a convenient built in mounting eyelet and water resistant body allowing you to hang the Smart Wave anywhere you can put a nail. The SmartWave is also easy to use with 3 different movement programs set with the turn of a dial; Alternating, Synchronized and Feed. The interval length is easily set with just the turn of a knob around a clearly marked time scale. LED indicators quickly tell you what is on and what is off. 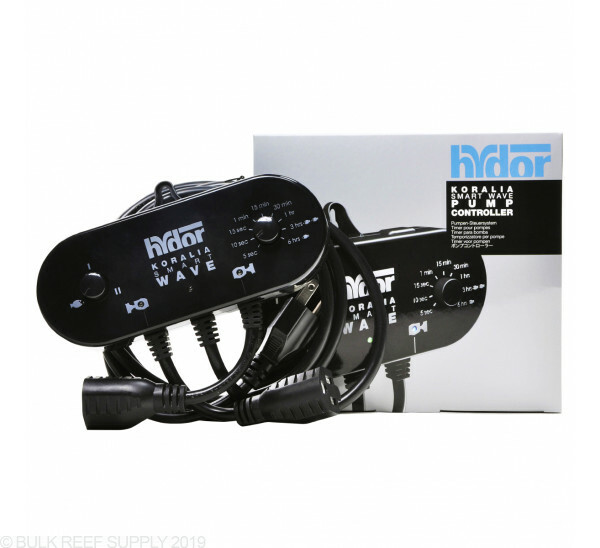 The Smart Wave works with Koralia Nano, Evolution, Third Generation, and Magnum Pumps as well as other powerheads on the market compatible with ON/OFF programs. Today this "wave maker" failed on me after just over a year of use, pretty disappointing for $70, I would recommend looking to other products if you plan on keeping it longer than a year. This is the absolute worst product i have bought while in this hobby! The biggest issue is the name, "smart wave" puts you under the impression this is a wave maker; that it will create waves in the aquarium, rippling water etc.. it does no such thing or anywhere even close to that. I met a Hydor spokesperson at a local show and he said it's not their problem. Needless to say they'll never see one more cent from me or any of my friends in this hobby again. Other issues are of course the loud clicking but that is the least of my concerns, as annoying as it may be. Change the name of the product, or be *Specific* about what your products functions are Hydor. This is a very simply and effective controller for the price. It gets the job done! I bought this unit with a pair of nano 425 pumps. The controller has been working fine fore ~4 months now, and seems to be well built. My issues are 1) You get either synch or switch and a period. This was my fault for not reading more about it before ordering, but for the price I expected a little more. 2) My unit has very loud relays in it. The pumps themselves are very noisy switching on/off, but the smartwave also makes a loud "clunk" when it switches a pump on. 3) The power leads are very inconvenient. It would be a huge improvement if the two pump leads were just regular receptacles on the bottom of the unit. As is the leads are stiff and a bit of a pain if you want to plug in a power strip instead of just a powerhead. Looking back on it I wish I'd just bucked up for a vortech or some other DC pump with variable speed. I have some loud clicking when the larger hydor pumps initiate. Not an issue with the wavemaker (this product) itself, but the inexpensive pump. This product does what it says it'll do. I've been using it for about 10 months now with no issues. I have it runner a couple of hydor pumps in my 70 gallon basement sump where the loud clicking isn't an issue for me. Does as advertised and is a great price compared to the competition. Extremely easy to use and achieved the wave-like motion I wanted. I am using this to run two 600 gph pumps and its giving my 75 gallon tank all the current it needs. Easy to set up and offers several wave modes. Am I correct in assuming that if I only hook up one power head that it will cycle on and off? I am OK with that if that is the case as I am putting this on a 10G nano tank. This will still cycle one power head on and off if only one is installed. Feel free to let us know if you have any further questions! I want to get this product but I am concerned about the clicking reported in the reviews. How loud is it? Loud enough to hear across a room? Is there another power head brand that would be compatible with this controller that may not have the clicking problem? Clicking will vary depending on the AC pump you are using as they have built in stoppers, Most clicking is hardly audible at a close distance and typically only heard next to the tank. All AC pumps will have some clicking but we find Sicce does have some improved silencing options!